Dennis Gabor was born in Hungary on 5 June 1900. He studied electrical engineering first in Budapest, later in Berlin, where he finished his academic education with the award of Dr. Ing. in 1927, with his Thesis on the Recording of Transients in Electric Circuits with the Cathode Ray Oscillograph. In this work he was the first to use an iron-shrouded magnetic lens, and a bistable electronic circuit for the self-recording of transients. The last part of this work was done in the German Association for High Voltage Networks. Afterward, he joined the Siemens & Halske A. G. Berlin, where he started his long list of investigations on gas discharges and plasmas. The most far reaching result of his six years with Siemens & Halske was his invention of the molybdenum tape seal, which is used to this day in all high-pressure quartz-mercury lamps. In 1934, Gabor, who was Jewish, left Germany to escape the Hitler regime. He went to the British Thomson-Houston Co. Research Laboratory, Rugby, England, first on an inventor's agreement, later as a member of the research staff. He spent fourteen fruitful years at the laboratory. The low-pressure gas discharge lamp with a positive characteristic, which could be operated on the mains like an incandescent lamp, with which he started his work, was not a success, as it had insufficient life, but he was luckier with other inventions, such as a cathode ray tube with a memory, and finally with holography. Holography is a photographic technique which creates a three-dimensional image. It was born as an attempt to improve the electron microscope. It was well known since 1936 that the resolving power of electron microscopes had to stop tantalizingly short of resolving atomic lattices, because the aperture of electron objectives could not be increased beyond a certain limit, owing to the spherical aberration which could not be corrected. Gabor considered the possibility of taking first a "bad" picture and correcting it by light-optical means. But in an ordinary electron microgram this is not possible, because one-half (the more important half) of the information has dropped out: the phase of the electron waves. Gabor thought "of course the phase has dropped out, because there was nothing to compare it with. Let us see what happens if we put in a known wave, as a phase standard." A little mathematical analysis showed that this would indeed work, one has only to superpose on the "bad" image, which is entirely unlike the true image, a "coherent background", (nowadays called a "reference wave".) If now one illuminates the "bad" picture with the coherent background, or a light-optical simulation of it, the true image will come out, because the original wavefront is reconstructed. Gabor termed the "bad" image, (which is indeed entirely unlike the object, it rather looks like a collection of fingerprints) a "hologram" (from the Greek holos, "the whole"), because it contained all the information. He then verified the theory, in 1948, by light-optical experiments with coherent light. These "classic" holograms are now well known, and have been often reproduced. Other work by Gabor during his time with the BTHCo was his Theory of Communication, which is now known as "structural" theory as distinguished from the Shannon-Wiener "statistical" theory. One of its results was what Gabor called the "complex signal" and which is in the same relation to the real signal as the "phasor" to a sine wave. 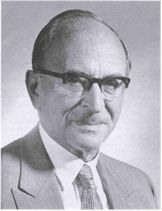 In 1949, Gabor joined the Imperial College of Science & Technology, first as a Reader (Associate Professor) of Electronics, later as a Professor of Applied Electron Physics until 1967. During this time, he carried out some twenty, mostly experimental, investigations with his Ph.D. students. They cleared up the "Langmuir Paradox"; the surprisingly fast apparent establishment of Maxwellian distributions of electrons in a low-pressure plasma, which had worried Gabor for twenty-five years. Though Gabor was always a passionate scientist and inventor, he was almost equally interested in social problems, and he was one of those people who could not help looking into the future. In his spare time he wrote the book Inventing the Future (1963) which has been translated into seven languages and influenced numerous "futurologists." Gabor emphasized the normative approach; instead of extrapolating from present-day trends, which when continued long enough are almost certain to lead to tragic conflicts. Instead he hoped people would invent in broad lines a possible and desirable future and steer towards it. Dr. Gabor received the IEEE Medal of Honor in 1970 "For his ingenious and exciting discovery and verification of the principles of holography." In 1971, he was awarded the Nobel Prize in Physics. Gabor was happily married to Marjorie L. Butler of Rugby in 1936. After his retirement they led a somewhat complicated life, in three countries; in England, where Gabor was still a Senior Research Fellow in his College, in the U.S.A., where he was Staff Scientist of CBS Laboratories, and in Italy, where they built a villa near Rome. He passed away on 9 July 1979 in London. Malcolm W. Browne , “Dennis Gabor, at 78; Nobel Prize Winner,” New York Times, Feb 10, 1979. This page was last edited on 14 August 2017, at 14:55.